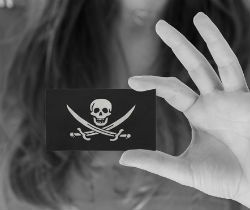 The UK Government is working with copyright holders and Internet providers to roll out a piracy education and warning system. Information obtained by TF shows that the Government has no marketing budget left to spend on the measures, and that it will justify the spending with an expected increase in sales tax. A few weeks ago the UK Government announced its support for a new anti-piracy plan, the Voluntary Copyright Alert Programme (VCAP). The Government teamed up with copyright holders and ISPs, who will start sending warning emails to pirating Internet users next year. In addition there will be a broader educational campaign to steer people towards using legal options. While the campaign is a private initiative the Government has decided to back it financially with several million pounds. However, TorrentFreak has learned that the Government funding wasn’t straightforward and was made outside of the available marketing budget. Through a Freedom of Information request we obtained an email conversation between the UK Intellectual Property Office (IPO) and music industry group BPI. In the email from May this year IPO’s Ros Lynch explains that there are no regular marketing funds available to support VCAP. 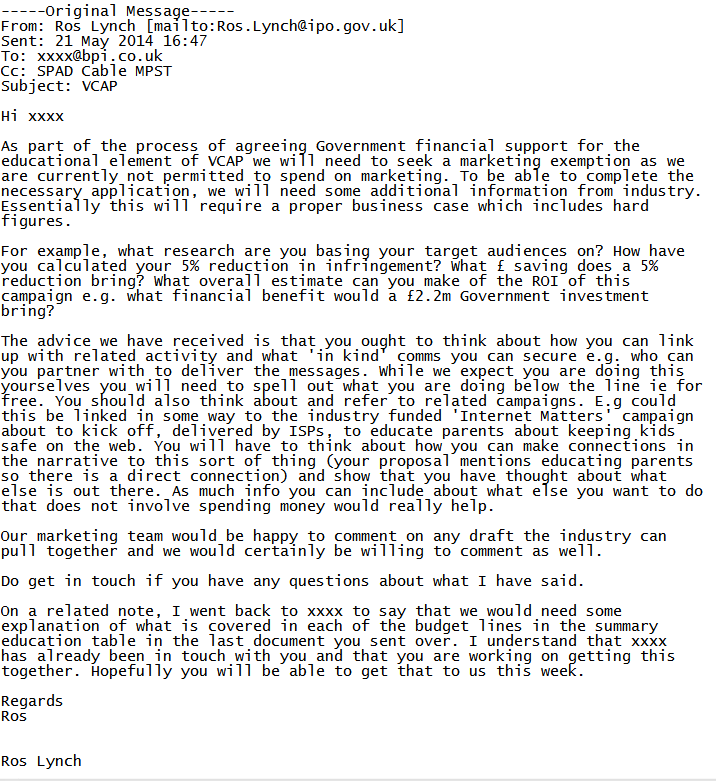 “As part of the process of agreeing Government financial support for the educational element of VCAP we will need to seek a marketing exemption as we are currently not permitted to spend on marketing,” Lynch writes to BPI’s Ian Moss. To be able to get the exception the Government needs additional information from the entertaining industries, showing that the investment makes sense financially. Or put differently, that the Government will see a good return for their invested taxpayer money. “Essentially this will require a proper business case which includes hard figures,” Lynch writes. The above suggests that the BPI is predicting a 5% drop in piracy from the anti-piracy measures. However, in a response to the IPO’s request the industry group writes that even with a lower success rate the Government’s spending will pay off. In a “Summary Business Case” (pdf) BPI uses the expected VAT increase to convince the Government of the “profitability” of the campaign. It estimates that if 15% of all illegal downloads are lost sales, piracy only has to decline 1% over three years for the Government to recoup their investment. “The underlying assumptions are based on very good data that has been produced by Ofcom and by a number of academic studies looking at the replacement ratios. It shows that only very small changes in piracy lead to significant returns to Government,” BPI notes. The music industry group stresses that the calculation only looks at VAT income and that the effects on the wider economy may be even greater. However, the static model they presented should already be good enough to warrant the funding. “So even from a very simple, static assumption, a small reduction in piracy of between .49% and 1% over the three years would return Government investment of £4m in an education scheme,” BPI writes. This prediction was apparently good enough for the Government to invest in the new anti-piracy plans beyond the available marketing budget. Even more so, the authorities committed £3.5 million to the campaign, instead of the £2.2 that was discussed in May. Whether the Government will indeed be able to recoup the taxpayer money through the anti-piracy campaign will be hard to measure, but the plan is going full steam ahead.